Learn how to manage your direct reports' training in UC Learning Center. Managers will have access to their direct reports if they are set as their employees’ direct managers in the MyTime Entry online timekeeping system. 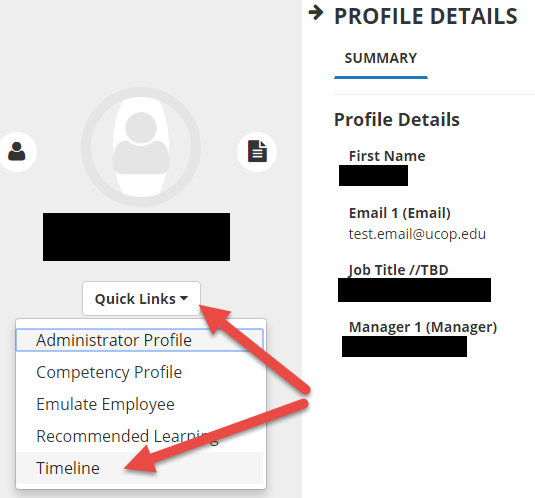 Once you have been identified as the manager of a user in the UC Learning Center, you will automatically have the My Team icon in the Top Menu. This will give you access to a Manager Dashboard. 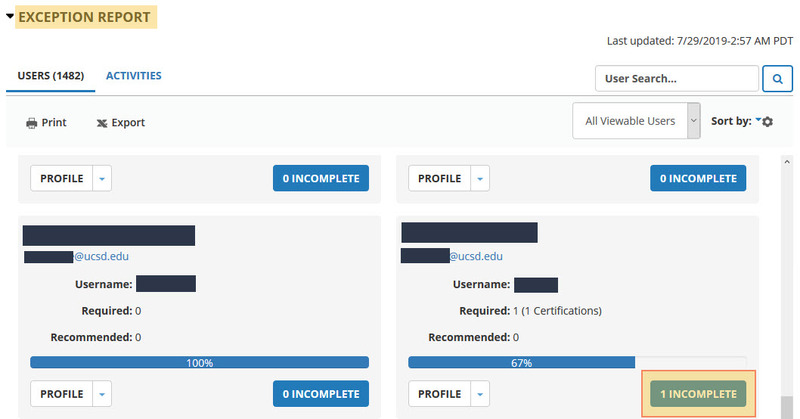 A snapshot of your current exception report, which shows the overall status of your managed users’ assigned training. A list of your managed users with the status of their individual assigned training. 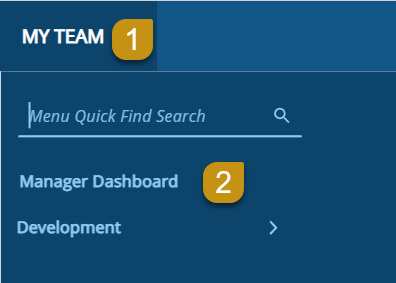 Note: Your Manager Dashboard is updated nightly, so if one of your users completed training after the last update, it will not appear in this view until the next update. However, the user’s training transcript and schedule are displayed in real time and will show you their latest status. In the Manager Role, you have the ability to view information about your managed users and the progress of their assigned activities. Your viewable users are displayed in tiles on your Manager Dashboard. You can scroll through these tiles to locate a particular individual or you can search the user by name, or sort in ascending or descending order (by name, assignment progress, etc). You will see all users you have access to view, either as your direct reports or as managed users whose training you are responsible for managing. If you manage more users than just direct reports, you can change your view from All Viewable Users to Direct Reports to view only your direct reports. When you first enter your Manager Dashboard you will see an overview of your managed users and the status of their assigned training. The Exception Report at the top will show you the percentage of compliance your managed users are currently at for all training assigned. For each individual, you will see the overall status of their currently assigned training. Click the blue Incomplete button to see a more detailed report. Remember, you can also sort this list by process. You can also see what training is assigned to your managed users and the overall completion of that training. You can also view trainings assigned to your managed users and the overall completion of the training. Switch from the Users view to the Activities view to view all activities assigned to your managed users. You will now see how many are still required to complete each training and the overall percentage of completion. 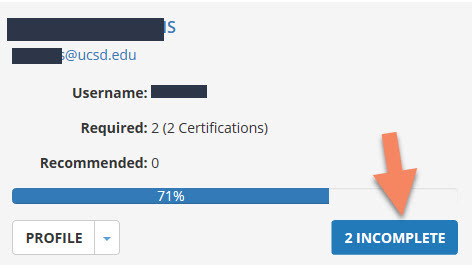 Click on the blue Users button to see who is still required to complete the training. Locate the users you wish to see more information about. A list of all training that has been assigned to the users. The Due Date for each training. Their Overall Progress in completing all assigned training. Clicking the Title of a course will show you more information about the training. Using the menu bar on the left side, you can filter the training to show only what assignments are Overdue or what has been Completed. You will see when the information was Last Processed in the top right corner. Clicking the Close button will take you back to your Manager Dashboard. To view all completed training for a managed user, you can view their training transcript. Locate the user you wish to find out more information about in your list of direct reports or viewable users. Click the drop down arrow next to the white Profile button. This will launch Emulation Mode, which allows you to view Learning details about your managed users. You know you are in emulation mode by the orange "eye" in the top menu bar where the "Self" icon would typically display. You will be taken to that user's transcript. Select the timeframe you wish to review using the year or date range filters. Note the default view is for one year. You can view the transcript or individual certificates of completion and export them to PDF. Click Export to PDF in the top right corner. Click File to download the PDF, and then OK.
Click the certificate logo next to the course name. 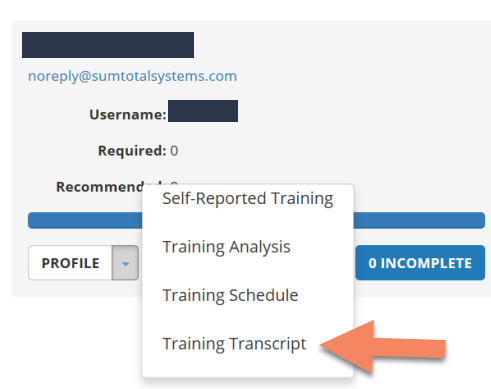 You can easily view the training transcript of a managed user to view all of their completed training. Locate the individual whose transcript you wish to view. Click on the Profile button. Click the Profile Details button on the About Me page. Click the Quick Links button on the Profile Details page and select Timeline. You can view current and upcoming training activities on the Timeline page. Locate the activity you wish to register for by using the Library or Search functions. Click on the drop-down arrow next to the Select button and choose Register Others. If this is an online course, click Continue to add users. If this is an in-person training you will need to select the offering you wish them to attend first before you can click Continue. Click Add under Available Users to locate the users you wish to register. There are several options to narrow down the users you wish to add. As a Manager, the only option that will be relevant is Select Viewable Users. Type a user's name in the search box and click the Arrow button. Browse the list of users for individuals you wish to register. Click Select All at the bottom of the page to select all active users or select the top box to select all users on the current page. Select the check box next to the user's name that you wish to register. Click OK at the bottom to continue. Click the Top Arrow Button to move the selected users over to Registration. 4. Click Submit once all users you wish to enroll have been moved over. 5. The users are now registered for the activity. Note: If the activity is in-person they will receive an email notification of their registration. If the activity is online there is no registration notification, so you may want to inform them they need to complete the training.